Job: Incumbent, school board District 2. She also has a paid position with the Probation Department, where she works a 4-10 work schedule. Platform: She wants to achieve a 100 percent graduation rate, reduce the number of English language learners and promote college and career readiness for all LAUSD graduates. Campaign funding: García reported $163,693.40 in contributions and $130,812.65 in expenditures to the Los Angeles City Ethics Commission, leaving her campaign with $37,119.40 cash-on-hand as of Jan. 21. She has also received $32,750.32 in support from an independent expenditure committee called Parent Teacher Alliance, which is sponsored by the California Charter Schools Association Advocates, the organization’s fundraising arm. Endorsements: Service Employees International Union (SEIU), Local 99, Service Employees International Union (SEIU), State Council, Los Angeles/Orange County Building Trades Council, LA School Police Union, Southern California Alliance of Law Enforcement (SCALE), California Coalition of Law Enforcement Association (CCLEA), Planned Parenthood, Jose Huizar, L.A. Councilman, Nury Martinez, L.A. Councilwoman, Grace Napolitano, Congresswoman, Alex Padilla, CA Secretary of State, Ricardo Lara, CA Senator, Maria Brenes, Executive Director of InnerCity Struggle. 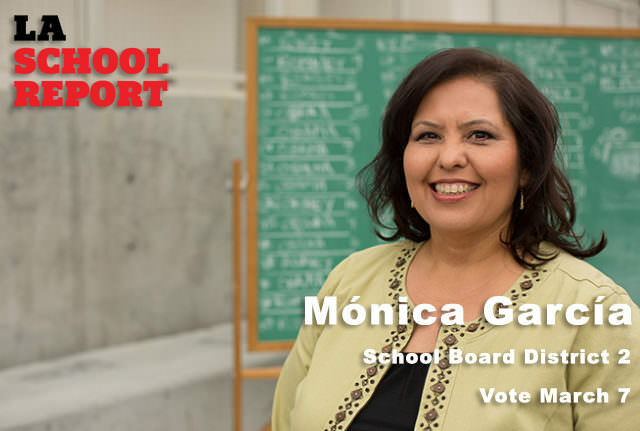 Los Angeles Unified board member Mónica García has spent more than 10 years in one of the most critical positions in education in Los Angeles, representing Local District 2 covering most of the downtown area and East Los Angeles, where both she and the Chicano movement were born 48 years ago. She’s running for her fourth and last term to continue representing the schools of disadvantaged communities she knows well. This is her third full term, though, having run in 2006 for an unexpired term, then in 2009, 2013 and finally 2017. “I’m a big Chicana nerd,” she said proudly. She recounts her grandfather’s arrival in the U.S. as a “bracero” worker and her family’s struggles as immigrants — much like many in the district she represents. She said after a decade of working on the board, and as the third Latina in board history, she is “pleased with the progress but not satisfied” because the main vision for the district has not yet been fulfilled, she said. “Part of what I’m proud of is the increase in the graduation rate, the reduction of the dropout rate and the suspensions. The work has not gotten any easier, the work is always difficult, but the people in this district are amazing and had met each challenge with grace, just like the movement of ’68. They taught us to keep fighting,” said García, who lives in El Sereno with her sister. She has no children of her own, but she has eight godchildren, whom she cares as deeply for as she cares for the students she represents in her district, she said. García was first elected in 2006. If she wins, it will be her last term on the board due to term limits. During her time on the board, she has had to make some tough decisions, and some of them have directly gone against those who have supported her in the past. During her past two terms, she has been dealing with the threat of district deficits, and that’s another reason why she said she wants to run for re-election. She thinks she has “learned a lot” and wants to put that experience to work. “I have learned how this district can change, how leadership does matter and the choices that are made at every level matter every single day. The budget is always a challenge, but there are options, it’s a matter of what you choose to do, where do you want to see the results,” she said. She noted how in part that’s a consequence of education being underfunded in California. However, she said she is used to fighting with what she has. She also wants to improve services to reduce the time students are designated English language learners, but she did not specify how. Other board members consider the charter schools movement as a threat to the district’s enrollment, but García considers charters “partners” and part of the solution, but not the only solution. “Because my focus has always been 100 percent graduation, my focus is what works for kids and families. I think we don’t have one solution for families, we have many, so pilot, magnets, charter, all these different kinds of schools have to be spread throughout the district. That will bring more success, more enrollment and a healthier budget to the district. “I’m a practical person, so I think let’s support what is working and let’s change what is not,” García said. She feels confident of winning because she has a strong coalition support, including endorsements from various organizations including the LA School Police Union and the SEIU Local 99, and contributors to her campaign include elected officials, charter educators and philanthropists such as Eli and Edythe Broad. Even though she considers herself a lifelong Democrat because she believes that “education is the foundation for the democracy,” the Los Angeles County Democratic Party decided not to endorse García or either of the other two candidates. However, it did endorse Steve Zimmer, the board president running for re-election in District 4, and Imelda Padilla, who is running for the open board seat in District 6. García will face opponents Lisa Alva and Carl Petersen in the election. If no candidate receives more than 50 percent of the votes in the March 7 primary, the top two vote-getters go on to compete in the May 16 general election. Petersen moved to the district, he said, in order to run against her. Asked about the new Trump administration and its proposed education policies, García said she thinks the new administration has been misinformed about what Los Angeles is. 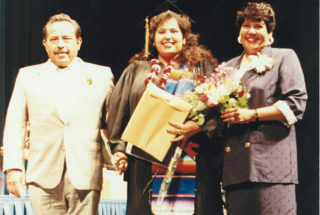 With her parents at college graduation in 1991. García shared other passions in her personal life such as playing poker, exploring new things and volunteering, as she did at the 1984 Olympic Games as a teenager and registering voters, but she said her biggest joy is spending time with people.